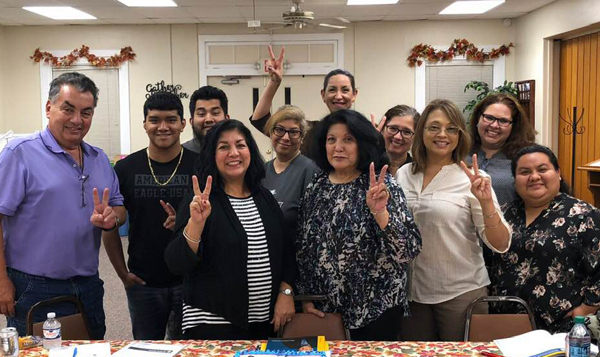 Students of The South Texas Emerging Markets Development Fund, Inc. hosted Dave Ramsey’s Financial Peace University course recently graduated from the financial literacy course they began on September 11, 2018. The nine week course covered topics such as financial, educational, retirement, education and investment planning as well as teaching the basics of budgeting, eliminating debt and planning for the future. The classes were held at First United Methodist Church in La Feria. Dave Ramsey has become well known for his financial education and planning. He created Ramsey Solutions in 1992 and has built an impressive financial empire including six best-sellers in the New York Times, Wall Street Journal and Publishers Weekly. He hosts the Dave Ramsey Show on the radio, offers multiple courses and training seminars, holds events country-wide and provides a number of tools to get you on the path to financial literacy. “Ramsey Solutions provides biblically based, common-sense education and empowerment that give HOPE to everyone in every walk of life”. Since 2009 STEMDF has grown to add assistance in providing affordable housing to low-income and moderate-income families in underserved areas. More than $270,000 in loans to small businesses has been provided by STEMDF, in its first four years. The nonprofit was awarded a grant from the Community Development Financial Institutions (CDFI) Fund to install its office. The organization has also received three $10,000 grants to bring Financial Literacy classes to generally underserved areas. “I am so glad that I took the Dave Ramsey Financial Peace University class sponsored by the La Feria based non-profit South Texas Emerging Markets Development Fund, Inc. I thank the United Methodist Church in La Feria for providing the meeting place for our group.” said Olga Oberwetter, a recent student of the course. Oberwetter says working on a budget, staying within the budget, and ridding oneself of debt can eliminate so much of the financial stress one feels on a monthly basis. Written by: admin on November 23, 2018.